This week the first test of the new PVC free blood bags, with human blood, started in Stockholm at Karolinska Universiy Hospital. 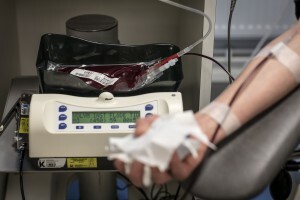 Alica Ravizza, appointed R&D by Haemotronic, and Hans Gulliksson, Associate professor in Experimental Transfusion Medicine at Karolinska University Hospital were supervising the first blood donations for the in-vitro evaluations. They were both very delighted to see that the bags performed so well during donation.